The Roman north gate built when the colony was founded in 50 AD. The outer side of the central archway bore the city's name: CCAA Colonia Claudia Ara Agrippinensium. 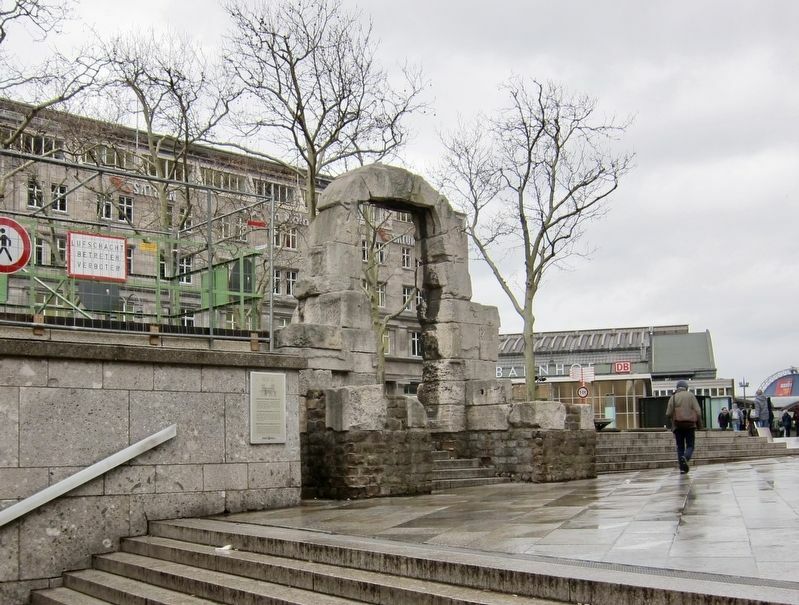 One of the side portals was rebuilt in 1971 above the visibly preserved remains of the Roman City gate and wall. Das römische Nordtor erbaut bei Gründung der Colonie 50 nach Chr. Der mittlere Torbogen trug auf der Feldseite den Stadtnamen CCAA Colonia Claudia Ara Agrippinensium. Von den Seitenbögen ist einer 1971 über den hier sichtbar erhaltenen Resten von Tor und Mauer wieder aufgebaut worden. La porte romaine nord construite lors de la fondation de la colonie en 50 ap. J.-C. 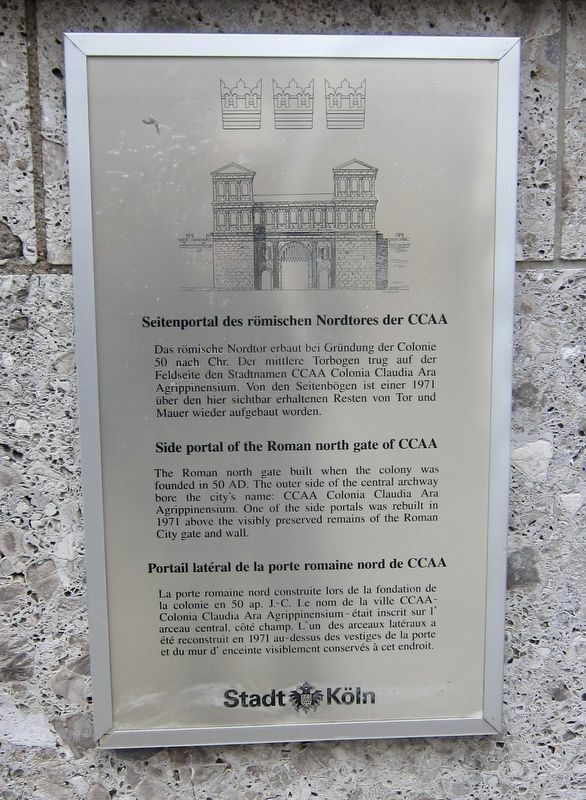 Le nom de la ville CCAA Colonia Claudia Ara Agrippinensium - était inscrit sur l'arceau central, côté champ. L'un des arceaux latéraux a été reconstruit en 1971 au-dessus des vestiges de la porte et du mur d'enceinte visiblement conservés à cet endroit. Location. 50° 56.487′ N, 6° 57.395′ E. Marker is in Cologne, North Rhine-Westphalia, in Köln. Marker is at the intersection of Kardinal-Höffner-Platz and Trankgasse on Kardinal-Höffner-Platz. Touch for map. Marker is in this post office area: Cologne, North Rhine-Westphalia 50667, Germany. Touch for directions. Other nearby markers. At least 8 other markers are within walking distance of this marker. Kapelle St. Victor / St. Victor Chapel (about 90 meters away, measured in a direct line); Brauhaus Früh am Dom / The 'Frueh at the Cathedral' Brewery (about 150 meters away); Georg Simon Ohm (about 210 meters away); Dominican Monastery Site and Albertus Magnus (about 210 meters away); Dr. Friedrich Joseph Haass (about 210 meters away); Matthias Joseph Scheeben (about 210 meters away); Friedrich von Spee S.J. (approx. 0.2 kilometers away); Teilstück des Römischen Abwasserkanals / Section of Roman Sewage System (approx. 0.3 kilometers away). Touch for a list and map of all markers in Cologne. More about this marker. The portal and marker are located in front of the Cologne Cathedral. More. Search the internet for Seitenportal des römischen Nordtores/ Side Portal of North Roman Gate. Credits. This page was last revised on April 8, 2019. This page originally submitted on April 8, 2019, by Andrew Ruppenstein of Sacramento, California. This page has been viewed 38 times since then. Photos: 1, 2. submitted on April 8, 2019, by Andrew Ruppenstein of Sacramento, California.